Healthy, Fresh-Made, Yummy! Indonesian, Chinese fusion cuisine - including vegan and vegetarian dishes! Mariana says, "My heart's desire is for people to be healthy and happy, and enjoy what they eat every day." 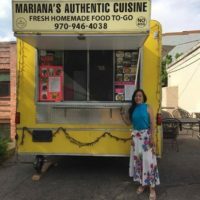 Until her relocation to Main Ave in July, you can get Mariana's delicious meals right here in the Powerhouse plaza. College Students: MakerLab Internship Available! College students: be our first MakerLab intern and jumpstart your career! The MakerLab at the Powerhouse is looking for an intern this summer. Through a partnership with the Southwest Innovation Corridor (SWIC) initiative, students from regional universities and regional residents attending universities outside the area are invited to participate in the Innovation Internship Program. 2017 Camp Discovery Registration Now Open! What are YOU doing this summer? Come build, create, play, and explore all areas of science! You won’t believe the fun! You’ll watch spectacular demonstrations, plunge into challenging discussions, and take home things you’ve created!